How do you write Ngũgĩ wa Thiong’o’s name in Korean? 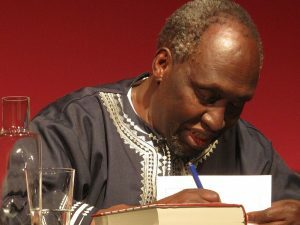 Kenyan writer Ngũgĩ wa Thiong’o (born 1938) is a giant of African literature. His name comes up every year as a candidate for the Nobel Prize in Literature, and though he was passed over in favour of a certain Bob Dylan this year, last month he was awarded the 6th Pak Kyongni Prize, the literary award established in honour of Korean author Pak Kyongni (박경리, 1926–2008) best known for her 16-volume saga Toji (토지 ‘Land’). In 12 December 2014, the Working Committee for Reviewing Loanword Transcription decided that the standard transcription of his name in the Korean alphabet would be 응구기, 와 티옹오 Eunggugi, wa Tiong’o. When he won the Pak Kyongni Prize, however, the spelling 응구기 와 시옹오 Eunggugi wa Siong’o was used. Both spellings can be seen in Korean translations of Ngũgĩ’s works, along with a further variant 응구기 와 씨옹오 Eunggugi wa Ssiong’o. Which is right? Based on the original pronunciation of the name in Kikuyu, I would put forward another option altogether: 응구기 와 디옹오 Eunggugi wa Diong’o. Kenya, like most countries in Africa, is a multi-ethnic and multilingual society. The two official languages English and Swahili are used as a lingua franca when Kenyans of different language backgrounds need to communicate, with Swahili spoken by more Kenyans than English. Swahili is originally the language of the Swahili people who inhabit the Indian Ocean coast from Kenya stretching south to Tanzania and northern Mozambique. Swahili is a Bantu language, meaning that it belongs to a branch of the Niger–Congo language family that is widely spoken in Africa south of the equator. Thanks to the Indian Ocean trade, Swahili also acquired many loanwords from Arabic. For example, the word ‘safari’ comes from the Swahili word for ‘travel’, which in turn is borrowed from Arabic سَفَرَ safara. Swahili was traditionally written in the Arabic script, but nowadays is written in the Latin alphabet. Ngũgĩ, like most Kenyans, speaks Swahili as a second (or third) language. His native tongue is Kikuyu, another Bantu language. It is spoken by the Kikuyu people whose traditional homeland is the area around Mount Kenya. According to the 2009 census, Kikuyus represent 16.9% of the population of Kenya, making them the largest ethnic group in the country. Kikuyus also led the Mau Mau Uprising (1952–1960) against British colonial rule. ‘Kikuyu’ is the Swahili form of the name by which it is known internationally, but the native name is Gĩkũyũ [ɣekojo] (Kikuyu is a tonal language, but tones are omitted from the phonetic transcriptions here as they are not crucial for comprehension and tone information is difficult to find). Kikuyu ĩ [e] and ũ [o] are mid-high vowels between the high vowels i [i] and u [u] and the mid-low vowels e [ɛ] and o [ɔ] respectively. Based solely on the pronunciation, you could transcribe ĩ and ũ in Korean as 에 e and 오 o respectively, but since they use the same base letters as i and u and are mapped to these vowels in Swahili, it would be simpler to transcribe them as 이 i and 우 u respectively. So we write Ngũgĩ as 응구기 Eunggugi, not 응고게 Eunggoge. 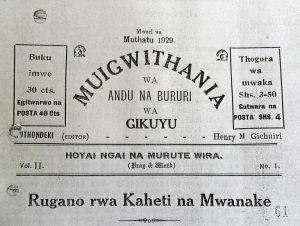 Ngũgĩ started out writing in English before rejecting it as the language of the colonizers and switching to Swahili and later his native Kikuyu. Caitaani mũtharaba-Inĩ (‘Devil on the Cross’, 1980), written while he was imprisoned because of the political contents of his works, is the first modern novel in Kikuyu. 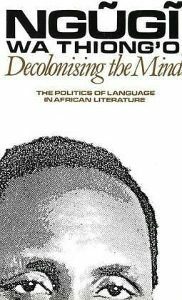 In his 1986 collection of essays titled Decolonising the Mind, Ngũgĩ argued that African writers should work in indigenous languages rather than those of the former colonial overlords. Kikuyus traditionally use patronyms instead of surnames. Ngũgĩ is the given name, Thiong’o is the given name of his father, and ‘wa’ means ‘of’. Therefore, Ngũgĩ wa Thiong’o means ‘Ngũgĩ (son) of Thiong’o’. Ngũgĩ’s son is also a writer and is called Mũkoma wa Ngũgĩ, ‘Mũkoma (son) of Ngũgĩ’. Therefore, Ngũgĩ wa Thiong’o is referred to by the given name Ngũgĩ, not ‘Thiong’o’ or ‘wa Thiong’o’. The reason the Working Committee recommended 티옹오 Tiong’o as the Korean spelling of Thiong’o is that the General Principles for Transcribing Other Languages (기타 언어 표기의 일반 원칙), a set of guidelines for transcribing languages not covered by the Loanword Transcription Rules (외래어 표기법), calls for the spelling th in such languages to be mapped to ㅌ t in Korean. However, Kikuyu th represents the voiced dental fricative [ð], the same sound as in English ‘this’. So Thiong’o is pronounced [ðiɔŋɔ] in Kikuyu. While Korean lacks dental fricatives, the ‘Comparison Table of IPA and hangul’ in chapter 2 of the Loanword Transcription Rules maps [ð] to ㄷ d in the Korean alphabet. This table is only used for transcribing English, German, and French, of which only English includes the sound [ð]. But it is true that ㄷ d is felt to be the closest match to [ð] in Korean. So if we follow the Kikuyu pronunciation, 디옹오 Diong’o is the closest transcription for Thiong’o. Similarly, the Kikuyu name Mũthoni could be written as 무도니 Mudoni, Gatheru as 가데루 Gaderu, Gĩthongo as 기동고 Gidonggo, and Mũthee as 무데 Mude (the spelling ee represents the long vowel [ɛː], and vowel length is not marked in Korean transcription). The place name Mũthaiga could be written as 무다이가 Mudaiga, and Mathare as 마다레 Madare to approximate Kikuyu pronunciation. The Kenyan environmentalist and Nobel Peace Prize laureate Wangarĩ Maathai (1940–2011) received the standard transcription 왕가리 마타이 Wanggari Matai, but would be closer to 왕가리 마다이 Wanggari Madai if the Kikuyu pronunciation is followed. She kept her husband’s Kikuyu name Mathai after her divorce, but added an extra a in the spelling. Perhaps because of this tweak, the pronunciation with the voiceless dental fricative [θ] (as in English ‘think’) seems to be more common in Kenya for Maathai. It could be that the name is no longer felt to be Kikuyu, and the th defaults to [θ] as in Swahili. The dental fricatives [ð] and [θ] are quite rare in East African languages. But they do appear in Swahili, the region’s lingua franca, mainly in the vocabulary taken from Arabic. In Swahili, [ð] is written dh and [θ] is written th. For instance, the Swahili word for ‘gold’ is dhahabu, from Arabic ذَهَب ‎ḏahab. So the sound [ð] is written th in Kikuyu but dh in Swahili, while th stands for [θ] in Swahili. In other words, the Kikuyu name Thiong’o would be written Dhiong’o according to the Swahili spelling convention. While it would be uncontroversial to transcribe Swahili dhahabu as 다하부 dahabu in Korean, the spelling th raises a thorny issue since it can represent either the voiced [ð] of ‘this’ or the unvoiced [θ] of ‘think’. In Kenyan proper names, th usually tends to be of Kikuyu origin and represents [ð], but not always. The place name Thika of uncertain etymology has [θ]. The sound [θ] in English is mapped to ㅅ s according to the official transcription rules as in 싱크 singkeu for ‘think’. This accounts for the spelling 시옹오 Siong’o for Thiong’o. But the rules are silent about how to transcribe th that represents [θ] in languages such as Swahili, Albanian, and Welsh. The spellings dh and th encountered in Kenyan names do not necessarily represent the fricative sounds of English ‘this’ and ‘think’, either. In Luo, a Nilotic language spoken in Kenya by the Luo people, dh represents the voiced dental stop [d̪] and th the voiceless dental stop [t̪]. So the Luo names Akoth and Okoth should be written 아코트 Akoteu and 오코트 Okoteu respectively in Korean (or 아콧 Akot and 오콧 Okot respectively if one chooses to write word-final voiceless stops after short vowels as syllable codas in Korean instead of appending an epenthetic vowel). Similarly, in the Luo name of the Kenyan writer Yvonne Adhiambo Owuor (born 1968) known for her novel Dust, the dh represents a voiced dental stop. What is more, many Kenyans whose native languages don’t have the dental fricatives [ð] and [θ] will replace them either with [z] and [s] or with [d] and [t] respectively. Korean, also lacking dental fricatives, is in a similar spot. Both [ð] and [θ] in English used to be written ㄷ d in Korean, but after the introduction of the Loanword Transcription Rules in 1986, only [ð] is written ㄷ d while [θ] is written ㅅ s. But some entrenched forms have preserved ㄷ d for English [θ] in examples such as 대처 Daecheo ‘Thatcher’, 맥아더 Maek-Adeo ‘MacArthur’, and 매머드 maemeodeu ‘mammoth’.  For ‘mammoth’, there is a common alternate form 맘모스 mammoseu, but 매머드 maemeodeu is the preferred form in standard Korean. One of the reasons that both [ð] and [θ] in English were written ㄷ d in Korean must be that they are both written th. Just maybe, as we have learned to distinguish different pronunciations of th when transcribing English in Korean, we will do the same in the future when we transcribe Kenyan proper names containing th. In both Kikuyu and Swahili spelling, ng represents the pre-nasalized voiced velar stop [ᵑɡ] (similar to English ‘finger’) while ng’ represents just the nasal [ŋ] (similar to English ‘singer’). The former maps to Korean ㅇㄱ ngg, the latter to just ㅇ ng. This is why Ngũgĩ is written 응구기 Eunggugi and Thiong’o is 디옹오 Diong’o. 으 eu [ɯ] is the epenthetic vowel in Korean, inserted in 응구기 Eunggugi [ɯŋɡuɡi] because [ŋ] cannot start a syllable in Korean but must be preceded by a vowel. Another peculiarity of Kikuyu spelling is that c represents a voiceless fricative [ʃ], similar to the sound spelled sh in English and Swahili. So Gĩcaru should be transcribed 기샤루 Gisyaru and Waciuma should be transcribed 와시우마 Wasiuma, following the usual mapping of [ʃ] to 시 si/sy. At this point in time, it may seem hopelessly idealistic to try to take into account the pronunciation differences of various languages such as Kikuyu, Swahili, and Luo when transcribing Kenyan proper names in Korean. But if African languages become better known through the activities of writers inspired by Ngũgĩ wa Thiong’o, perhaps that will become the norm one day, just as we take it for granted today that Swiss proper names should be transcribed in Korean according to their original German, French, and Italian pronunciations. The original version of this post in Korean can be found here.